This week, The Education Trust–New York released a report highlighting the lack of teacher diversity in the state’s schools. Specifically, the report reveals that one-third of all New York state schools have zero Latino or Black teachers. New York State is not alone. Lack of teacher diversity is a national problem. As the EdTrust report details, teacher diversity can improve achievement for students of color. So what can be done to address the problem? The issue begins with the fact that black and Hispanic students graduate high school at lower rates than their white and Asian peers. In New York State, 89 percent of white students and 86 percent of Asian/Pacific Islander students graduate high school compared to 68 percent of black students and 68 percent of Hispanic students. When fewer black and Hispanic students graduate high school, there are simply fewer students from these backgrounds entering college to pursue the preparation necessary to become a teacher. Furthermore—as the Urban Institute explains in a recent report that found this funnel problem to be prevalent across the country—teacher diversity issues are also exacerbated in the next step of the pipeline: getting to and through college. In New York State, 44 percent of white students and 51 percent of Asian/Pacific Islander students graduate high school earning a Regents diploma with “advanced designation” – the state’s diploma “recommended for students who plan to attend college after high school.” According to the most recent data, just 10 percent of black students and 14 percent of Hispanic students in New York State graduate with an advanced designation diploma. In short, until the K-12 education system does a better job of ensuring that black and Hispanic students are college ready, there will continue to be a huge diversity gap between the nation’s public school students and the teachers who educate them – especially in diverse areas like New York State. To be fair, fully addressing teacher diversity will likely require a combination approach with long-term and short-term solutions. But the importance of K-12 schooling cannot be forgotten. 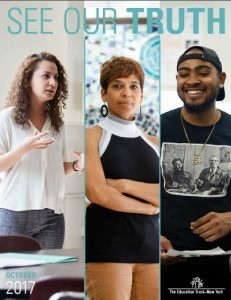 * Report authors recognize that New York must to do a better job of educating students of color so that they’re better prepared for college and career. The Education Trust has a plethora of reports detailing this issue. This entry was posted in Education Policy, Teacher Effectiveness and tagged teacher diversity on October 20, 2017 by Kaitlin Pennington. Last week, two D.C. State Board of Education members wrote a memo to D.C. Public Schools’ new Chancellor — Antwan Wilson — asking him to focus less on district reform mandates and more on creating a culture of “transparency” and “support” in the district’s schools. The authors write that reforms such as teacher evaluation and school accountability based on student achievement have led to undesirable outcomes in the district, including higher teacher turnover. It is true that teacher turnover generally harms student achievement. However, what is true in general is not true in all places. This entry was posted in Education Policy, Teacher Effectiveness and tagged DCPS, Teacher Evaluation, Teacher Turnover on August 9, 2017 by Kaitlin Pennington. A bill providing tax credits to teachers in California is making its way through the state’s legislature. Last month Andy Rotherham and I wrote that Senate Bill 807, the Teacher Recruitment and Retention Act, is a gimmicky way to pay teachers more and takes a one-size-fits-all approach to solving a targeted teacher shortage problem. It looks like the authors of SB807 may have noticed our critique. Since its introduction, the legislation has been revised. Instead of exempting all teachers who remain in the profession for more than five years from paying state taxes, the revised legislation is focused on teachers in high-poverty communities. The new language gives teachers in high-poverty schools immediate state tax relief on half of their income in their sixth through tenth years of teaching. Admittedly, the revised legislation is better than the original because it takes a more targeted approach to teacher shortage issues. But it’s still a bad idea. As Andy and I wrote, if California legislators want to pay teachers more, then they should just pay teachers more. Providing teachers with tax incentives is a confusing way to raise teacher compensation and doesn’t get at the foundational issues of under-resourced schools and misaligned, archaic state and district teacher compensation systems. This bill — in any form — tinkers at the edges of and distracts from larger issues in California. This week the bill passed the California Senate Governance and Finance Committee with a unanimous vote, and it’s now headed to the Senate Education Committee. But California lawmakers would be better off if they stop trying to revive this bill and, instead, focus on the larger school finance problems in the state. This entry was posted in Education Policy, State Education Policy, Teacher Effectiveness and tagged California legislature, SB807, Teacher Compensation, teacher shortage on May 12, 2017 by Kaitlin Pennington. 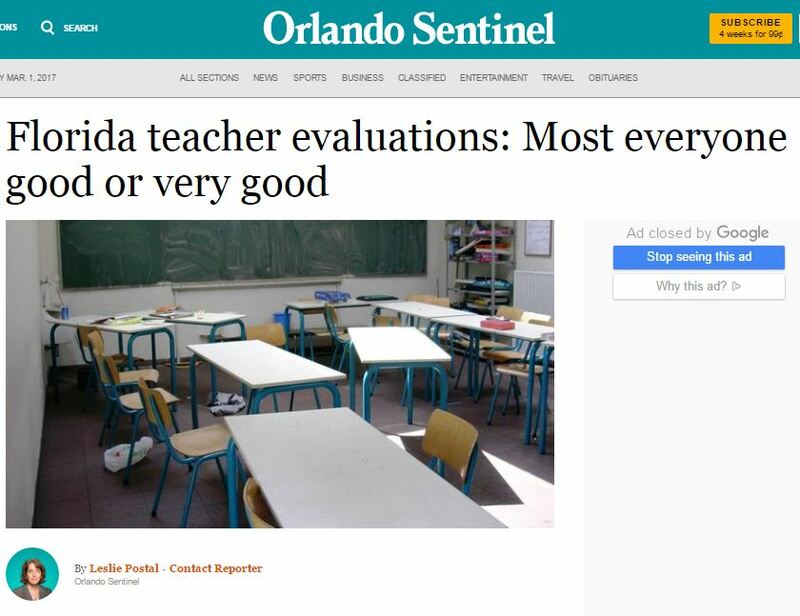 The headline “Florida teacher evaluations: Most everyone good or very good” in last week’s Orlando Sentinel felt like déjà vu. 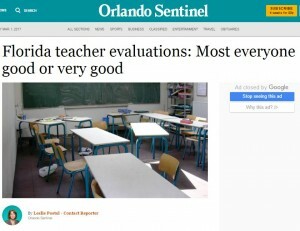 Similar headlines have graced the pages of local newspapers across the country, leading readers to assume that recent reforms of teacher evaluation systems weren’t worth the effort because teachers continue to receive high ratings. But that first impression is incomplete. My colleague Sara Mead and I grappled with this idea in a recent report. At first blush, it’s true that reformed teacher evaluation systems haven’t substantially changed the distribution of teacher evaluation ratings. And there are logical explanations for those results. Greater job satisfaction among effective teachers. A new study of Tennessee’s teacher evaluation system released earlier this month found that when teachers receive higher ratings under the state’s reformed teacher evaluation system, the perceptions of their work improve relative to teachers who received lower ratings. 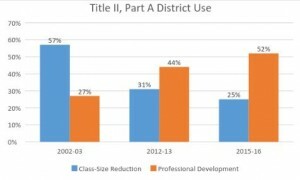 Higher turnover of less effective teachers. A 2016 report on the state of the teaching profession in North Carolina found that, for teachers at every experience level, those who left the profession had lower overall evaluation ratings and lower effects on student growth than teachers who stayed. The graph below shows the picture for student growth. 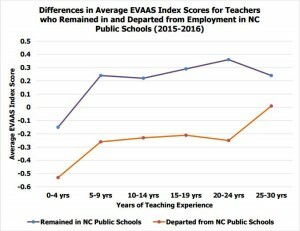 The blue line shows the growth scores for teachers who remained as teachers in North Carolina, and the red line shows those who left. 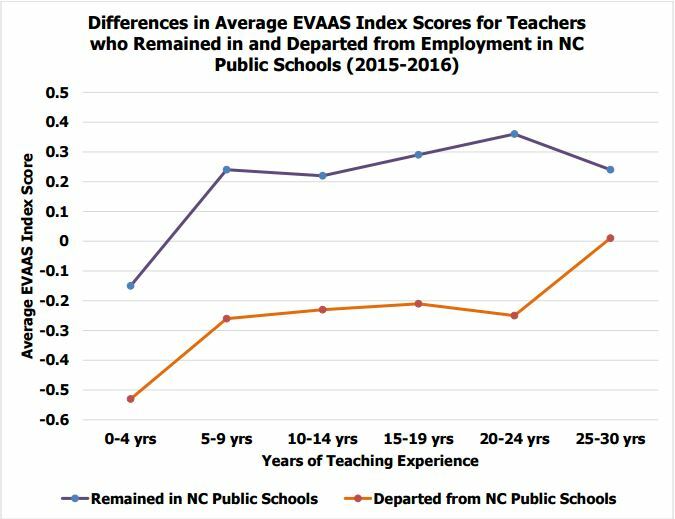 We don’t know if this is a story of correlation or causation, but at least North Carolina can now point to data showing that they’re retaining the best teachers. Higher turnover of less effective probationary teachers. 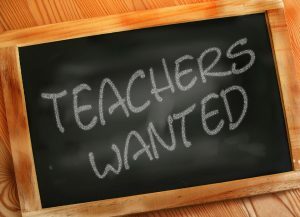 Similar to the outcomes in North Carolina, a 2014 study of New York City public schools found that teachers who had their probationary periods extended — that is, who were told they weren’t effective enough at that time to earn tenure — voluntarily left their teaching positions at higher rates. Although New York wasn’t actively dismissing low-performers, this notice was enough to “nudge” them to consider other professions. Improvement of overall teacher quality. A study of DC Public Schools’ (DCPS) teacher evaluation system, IMPACT, shows that the evaluation system encouraged the voluntary turnover of low-performing teachers. When the lower performing teachers left the district, leaders in the district filled the open teaching positions with new teachers who were more effective than the ones who left. The result has been a rise in overall teacher quality in DCPS. These and other teacher evaluation studies are complicated. They are not prone to eye-catching headlines. But nonetheless, teacher evaluation systems may be quietly having an effect on which teachers stay in the profession and, ultimately, whether students are learning. This entry was posted in Education Policy, Research, Teacher Effectiveness and tagged DCPS, Teacher Evaluation on March 2, 2017 by Kaitlin Pennington.